The dashes unit contains . . .
--Reasons for Dashes. Distribute this sixth-sheet to students at the beginning of the unit. --Dashes Classwork. 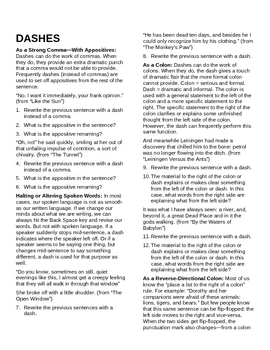 Complete these three pages along with the students. Answers are included--either as a standard printout or as a file to be used along with a video projector. --Dashes Practice 1 and 2. These students can practice on their own. Answers are included. --The Dashes Test. A matching test. Answers are included.